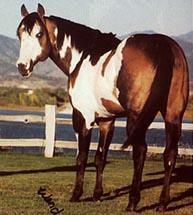 Barn name is " Gunner "
Enterprising Gunner is a 2007 14.2hh Bay Splash APHA Stallion, known as ‘Gunner’ around the barn. 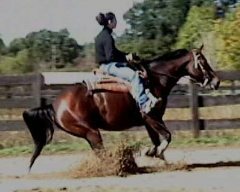 Gunner is by an accomplished NRHA Sire One Gun who is by the infamous Colonels Smoking Gun. 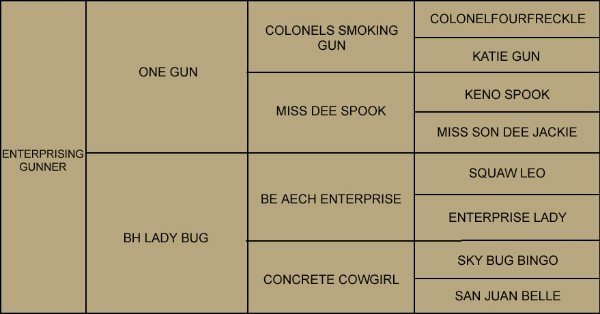 Besides the great Colonels Smoking Gun (NRHA 5 Million Dollar Sire & Hall Of Fame), Gunner also boasts great horses such as Be Aech Enterprise (Hall Of Fame & World Chamopin) and Enterprise Lady (Hall Of Fame) on his papers! 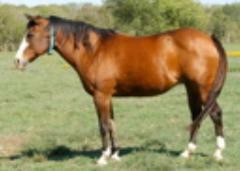 Gunner is a nice quiet and easy to handle stallion with a disposition to die for. Gunner will be started under saddle and see where it take us. If you are interested in breeding to Enterprising Gunner please Contact Us. 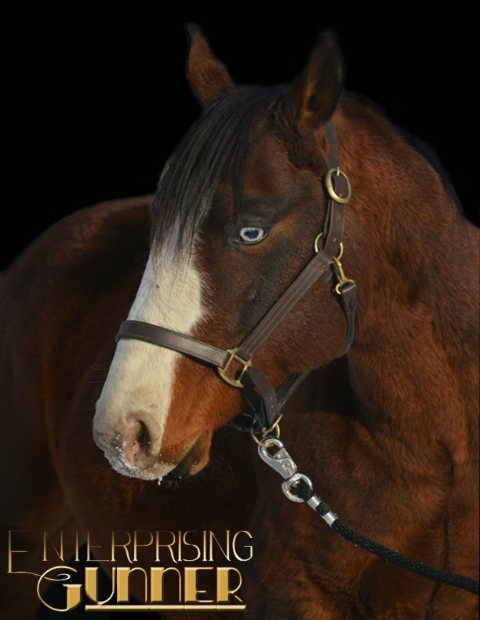 Enterprising Gunner carries GBED we do require ALL mares offered for breeding to be tested negative for GBED before a Contract will be executed. 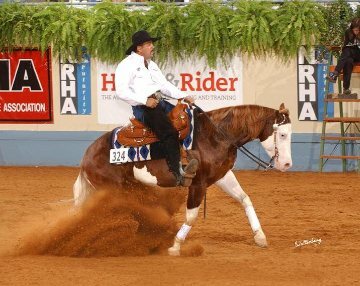 One Gun is 2005 DIXIE National Reining Open Champion 2006 APHA Reining Challenge Reining Open Finalist 2006 APHA Register of Merit 2006 MSRHA October Light Novice Horse Open Champion 2006 DIXIE National Reining Open Champion 2007 PHCI Derby Open Res. 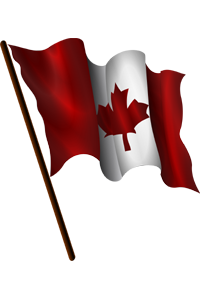 Champion 2007 IRHA Open Res. Champion (Reggio Emilia). One Gun is the Sire of ONE GUN DIAMOND, over $7,500 in NRHA Show, 2009 NCRHA Int. Open 6 Open Co- Champion, Tulsa Ariat futurity Ldt open finalist; SMOKIN SQUIRT GUN, 2012 High Roller Derby Level 1 Open 5° place, Level 2, Open 7° place; 2013 Cactus reining classic derby open Level 1 Champion, Level 2 Res.Champion; 2013 Nrbc Open Finalist; 2013Nrha Derby Open Finalist; BB ONE MIRACLED GUN, 2012 LR Snaffle -bit Open Co-Champion; 2013 Austrian Futurity 4 yrs old Level 2 Res. Champion; 2013 IRHA Futurity 4 yrs old Non Pro Futurity Finalist;GUNS APOCALYPSE SHOK, 2012 APHA Futurity Open Champion 2012 LR 5° tappa Int. Open Champion, LR Futurity Open 3° place; 2014 Belgian Derby Int. Open Res. Champion; ONE GUN BUN, 2013 IRHA Futurity 4 yrs old Open level 4 Finalist; CR HOT GUN LADY, 2013 Futurity 4 yrs old Futurity Open level 1 Finalist; FOREVERGUN, 2013 Nrha of Germany Futurity Ltd Open Champion, 2014 Nrha European Futurity Open Level 3&4 Finalist. 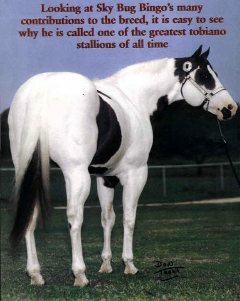 Sky Bug Bingo - Sky Bug Bingo a 1972 Sorrel Tobiano Stallion by Sky Top Bar x Juanita Bingo.had many achievements some of them being.APHA supremed champion,APHA champion,national champion get of sire,reserve national champion get of sire,supreme halter,16 cutting,15 western pleasure,14 hunter under saddle,13 reining,12 racing,11 barrel racing.Sire of 17 world national champions,29 APHA champions and the list goes on & on. Squaw Leo - H-1/P-4 NCHA Money Earner $911.46, COA Halter & performance point earner, sire of Rom Perf Offspring NRHA Money Earners NCHA Money Earners. 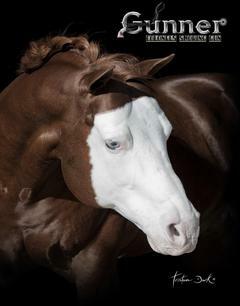 Sire of Be Aech Enterprise NRHA HAll of Fame,NRHA World Champion. 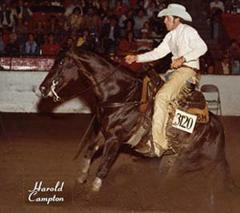 Enterprise Lady - H-0/P-21, NRHA Hall of Fame, Arena ROM, Youth World Champion reining in 1974. 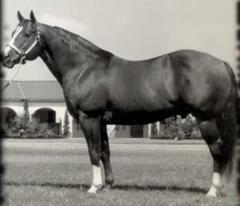 Produced NRHA Hall of Fame,NRHA World Champion,NRHA Million Dollar Sire.